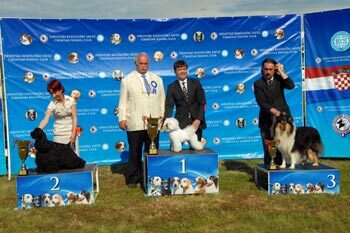 I am very proud of my little boy, having finished this year in a style under very well respected judges. I special thank you goes to Lana Premk for taking over for the group and care of Solo. Due to the bad weather Solo stayed with his handler Lana, while the rest of the team needed to go back home. Max was shown in Junior Handling by Neža Jereb, they placed 2nd in older JH group. Congratualtions, Neža! It was a fabulous Laton team weekend in a company of a great handler Sanna Vartiainen from Finland. Thank you girls for a nice weekend, I enjoyed your comany very much and learned a lot from all of you. Thank you Linda again, for handling Solo during the whole weekend, I am very happy that he earned 3 CAC tittles towards his Slovakian Championship! 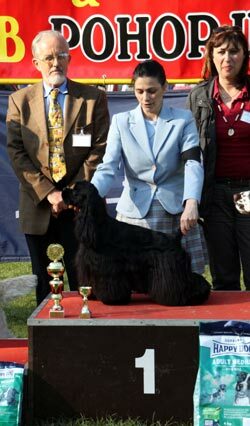 This was Solo's first time out in Czech Republik, shown exclusevly by his breeder Linda Volarikova. Thank you Linda! 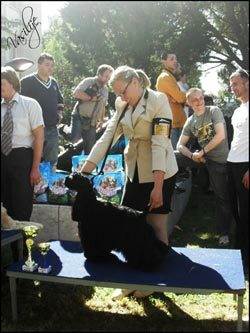 Started being show in adult class, Solo won intermedia class and won his first CAC title towards Slo CH. 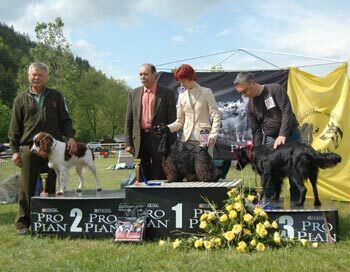 Solo - at both CACIB show Solo won ex1, CAC and R.CACIB and also finished Croatian championship. I would like to thank Linda and Albina for a great job! 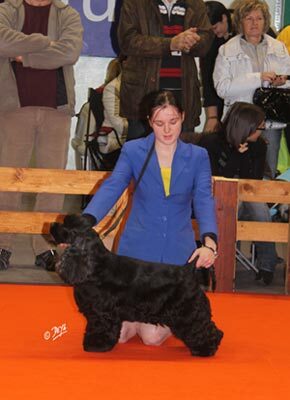 Solo finished his 5th junior championship at the show in Novi Marof. Shown only a month and a half he has earned many very well respected results. I would like to thank every body, who were a part of this jurney, specially to Albina & Lana for handling. Solo - ex1, CAJC, JBOB, res. JUNIOR BEST IN SHOW!!! Another successfull weekend for Solo in great company of my friends. I would like to thank every body for a wonderfull company and the time we spent together. Solo was beautifully presented and professionaly handled by Lana Premk this weekend. They have proven to be a very good team and Solo just fell in love with Lana. Thank you Lana for excelent done jo band good care of Solo. 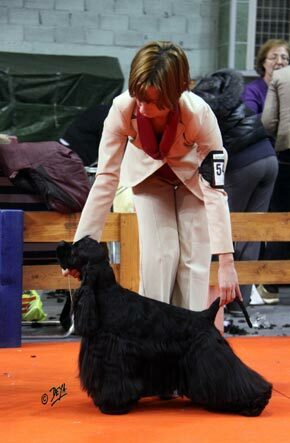 I am very happy for the results, especially because 13 american cockers were entered to each show. 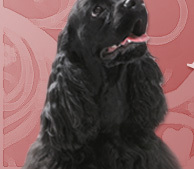 I would also like to thank all the judges, who have found Solo a special boy and awarded him with this amazing results. Solo - ex 1, CAJC, JBOB, BOB, BOG2!!! 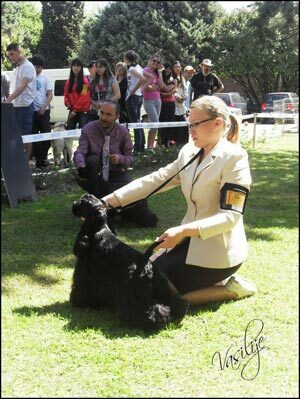 Solo - CAJC, J.BOB - handled by Albina. Thank you Albina for beautifull presentation of Solo during this weekend. Solo - ex1, CAJC, JBOB, BOB, BEST OF GROUP !!!! Solo was shown for the first time in Junior class, starting his "adult" show career. 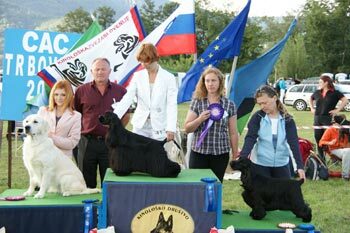 He was presented by Albina, they won CAC, J.BOB, first BOB and placed 1st BEST IN GROUP under very well respected judge Miroslav Zidar. Thank you Albina very much! I had a privilege to show a buff member of Layton family - Layton Repeat After Me alias Roly in junior class. We won CAJC, J.BOB, BOB and placed 3rd in Group. Thank you family Košmrlj for trusting me Roly and congratulations as well!